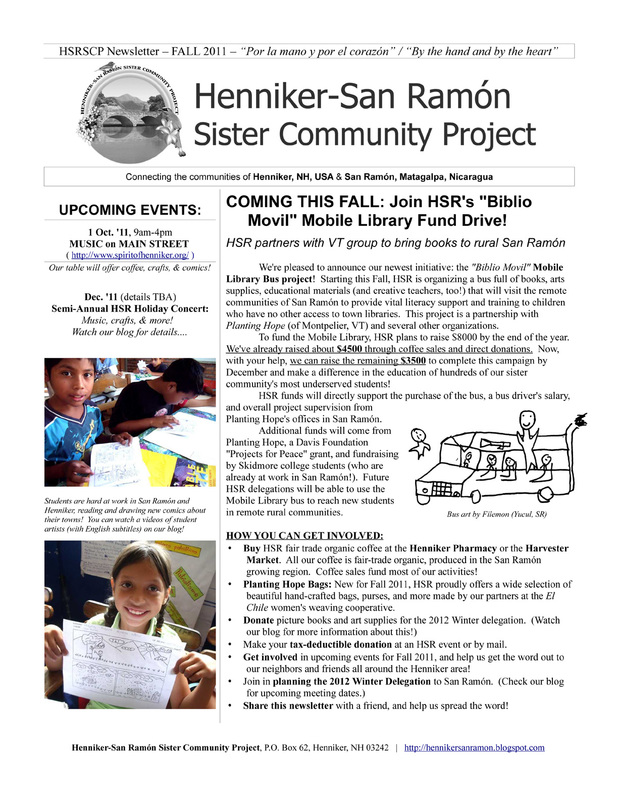 COMING THIS FALL: Join HSR's "Biblio Movil" Mobile Library Fund Drive! 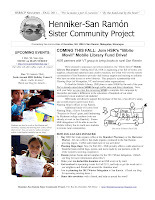 We're pleased to announce our newest initiative: the "Biblio Movil" Mobile Library Bus project! Starting this Fall, HSR is organizing a bus full of books, arts supplies, educational materials (and creative teachers, too!) that will visit the remote communities of San Ramón to provide vital literacy support and training to children who have no other access to town libraries. This project is a partnership with Planting Hope (of Montpelier, VT) and several other organizations. To fund the Mobile Library, HSR plans to raise $8000 by the end of the year. We've already raised about $4500 through coffee sales and direct donations. Now, with your help, we can raise the remaining $3500 to complete this campaign by December and make a difference in the education of hundreds of our sister community's most underserved students! HSR funds will directly support the purchase of the bus, a bus driver's salary, and overall project supervision from Planting Hope's offices in San Ramón. Additional funds will come from Planting Hope, a Davis Foundation "Projects for Peace" grant, and fundraising by Skidmore college students (who are already at work in San Ramón!). Future HSR delegations will be able to use the Mobile Library bus to reach new students in remote rural communities. Buy HSR fair trade organic coffee at the Henniker Pharmacy or the Harvester Market. All our coffee is fair-trade organic, produced in the San Ramón growing region. Coffee sales fund most of our activities! Planting Hope Bags: New for Fall 2011, HSR proudly offers a wide selection of beautiful hand-crafted bags, purses, and more made by our partners at the El Chile women's weaving cooperative. 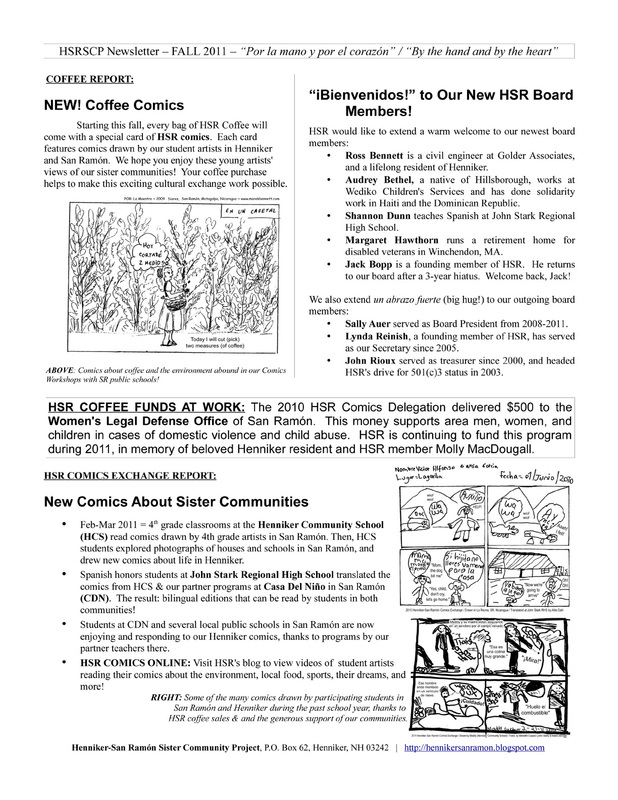 Make your tax-deductible donation at an HSR event or by mail. Get involved in upcoming events for Fall 2011, and help us get the word out to our neighbors and friends all around the Henniker area! 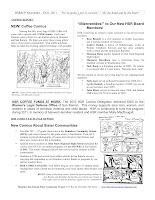 Share this newsletter with a friend, and help us spread the word! Your coffee purchase supports our work! (c)Henniker-San Ramon Sister Community Project .... Simple theme. Powered by Blogger.